This stealthy masterpiece covertly tells the time while keeping its namesake’s clandestine secrets safe. With its sophisticated black-on-black design, the Swiss made GV2 9700 Aurora tells the time on a need-to-know basis. Inspired by the super secret US military Aurora project, this 45 mm, IP black, 316L stainless steel timepiece exudes an aura of mystery. Luminous, skeletonized hands and raised silver indices clearly indicate the time without attracting undue attention. 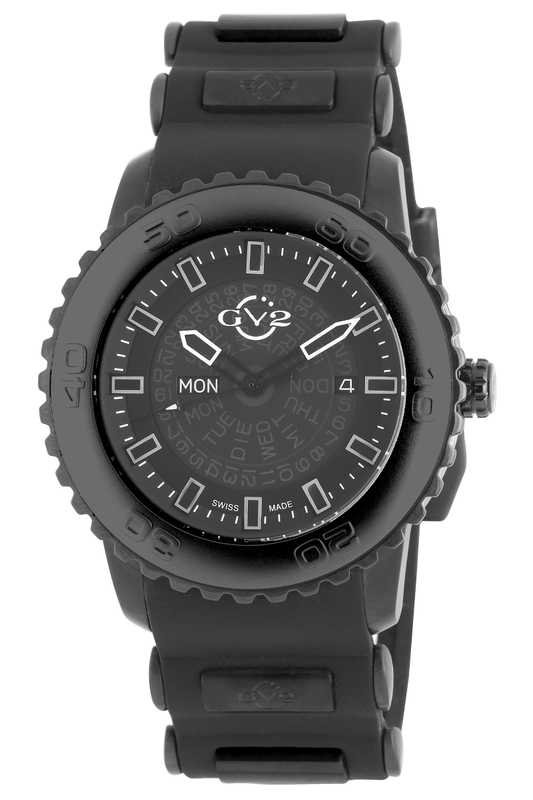 A semitransparent screen on the all-black dial partially reveals a bilingual date wheel below, while two well-positioned windows at 3 and 9 o’clock clearly indicate the correct day and date. 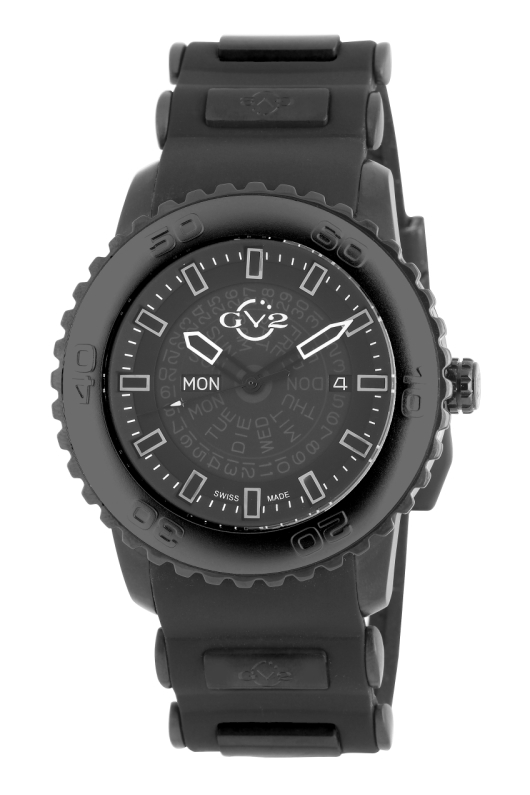 Adding further functionally to this inspired military design is a rotating, all-black aluminum bezel with tactile knurled edges and raised numbers. This unidirectional bezel functions as a practical tool for timing dives and other events, while remaining virtually invisible on the wrist. 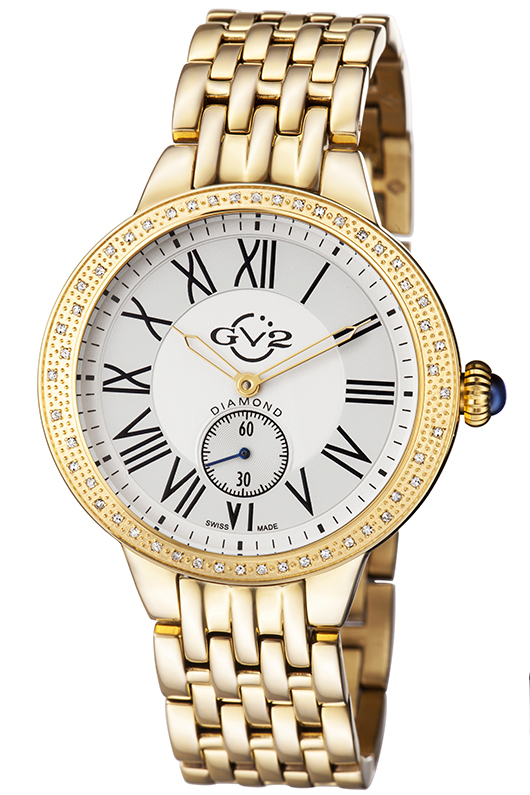 Powered by a reliable Ronda 517 Swiss quartz movement that is encased in durable 316L stainless steel, this is a timepiece that is ready for anything. 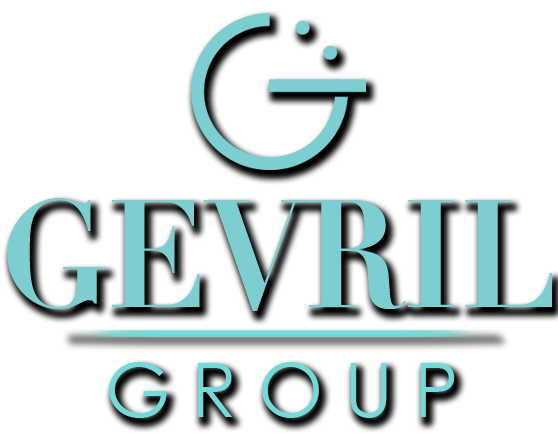 The GV2 9700 Aurora features an anti-reflective sapphire crystal that has been imprinted with the GV2 logo, has a screw-down solid stainless steel caseback, and is water resistant to 330 feet. This precisely engineered timing tool has been expertly engraved with a conceptual drawing of the mysterious Aurora reconnaissance aircraft on the caseback and has been fitted with a comfortable black silicone strap. If you’re a fan of stealth designs, this could well be the ultimate military watch. The clandestine Aurora project may be forever shrouded in mystery, but there is no need to keep the GV2 9700 Aurora a secret. 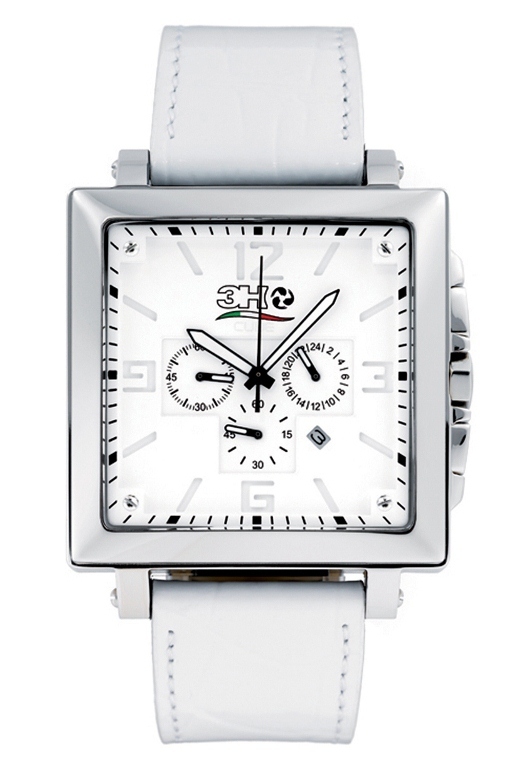 This is a timepiece any watch aficionado will wear publically and proudly. Like all GV2 timepieces, the Swiss made GV2 Aurora 9700 has the look and feel of a watch that costs many times more than its affordable price point. This exclusive timepiece is manufactured in a strictly limited edition and carries an exclusive two-year manufacturer’s warranty. Each GV2 Aurora comes in a special presentation box. To put one of these covert beauties on your wrist, just contact your nearest authorized GV2 dealer today. The timepiece was invented as an instrument. Its sole job was to keep time. Since the development of the smartphone with its built in digital time readout, the watch is no longer necessary in the contemporary world for its original purpose. It has been transformed into a fashion accessory that happens to tell time. And with that in mind, you need to choose how to decorate your wrist well. 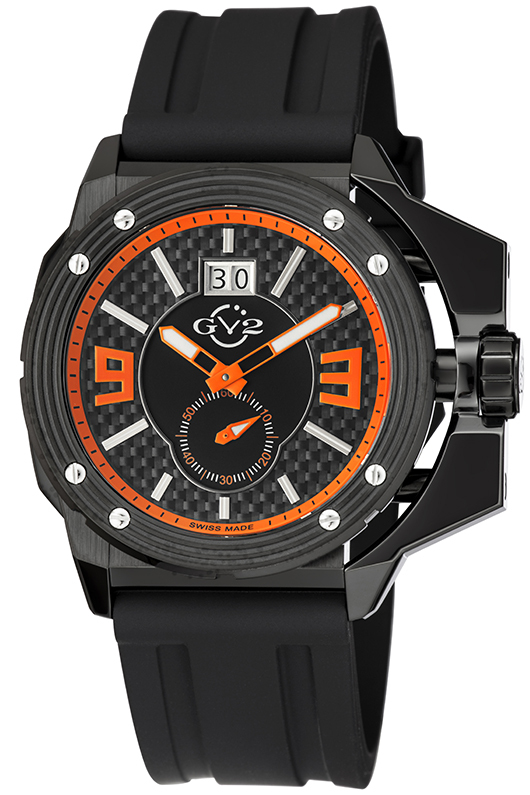 The GV2 Grande 9402 takes the bull by the horns in the fashion department with its design, color and materials. Those who follow the fashion scene will know that vibrant colors have taken center stage for the season. Fitting right in on the runways, the black diamond-patterned dial of the GV2 Grande 9402 is punctuated with strategically placed fluorescent orange color, including the minutes flange, Arabic numerals, hands and subdial at 6 o’clock. Take particular note of the design of the two Arabic numerals (3 and 9). 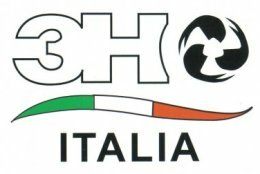 They are highly stylized and give the piece a very modern and unique look. For reading the time in low light conditions, the baton hour indexes and hands are coated with Super-LumiNova. The dial also includes a black on white big date aperture that blends nicely with the color scheme. What really draws attention to the GV2 Grande 9402 is the large case construction. Although the black IP coated stainless steel case measures 42 mm, with the case extension it takes up 50 mm of real estate, so it’s a very substantial piece on the wrist. The case extension, which protects the crown, matches the 21st century style of the Arabic numerals. With its interesting use of negative space, it resembles angular modern furniture design or architecture. Perfect for summer, the GV2 Grande 9402 fits around the wrist with a comfortable black silicone strap and buckle, which resists moisture and discomfort much better than a leather band. 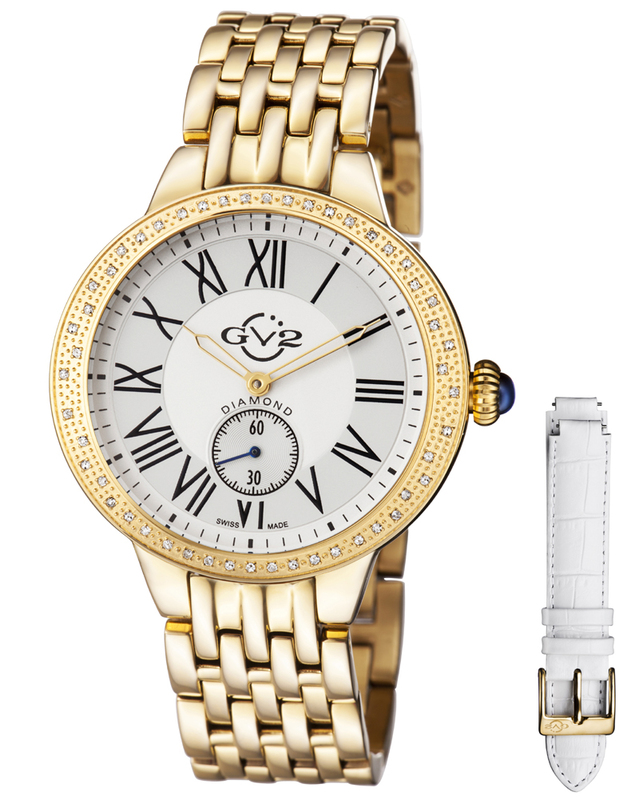 Powered by a Ronda 6004.B Swiss quartz movement for years of hassle free wear, the GV2 Grande 9402 is water resistant to 99 feet.